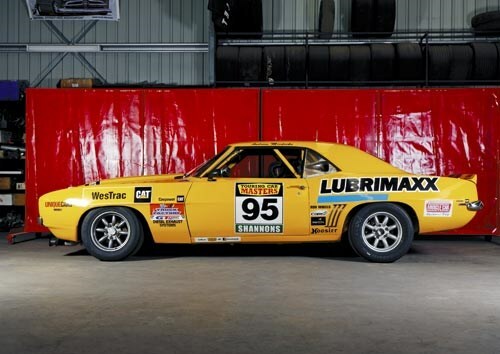 There was never going to be a dispute when it came to which make would get the nod when Whiteline Racing team owner Bob Middleton got the TCM bug. 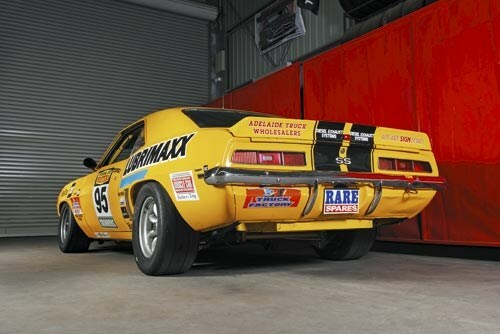 Simply put, Middleton is a heavily-committed Chevrolet fan and the Whiteline workshop was well stocked with Bow-Tie bits leftover from the South Australia-based trucking magnate's NASCAR racing days in the mid-'90s to early-Noughties. Middleton's CV isn't limited to super speedway, however. 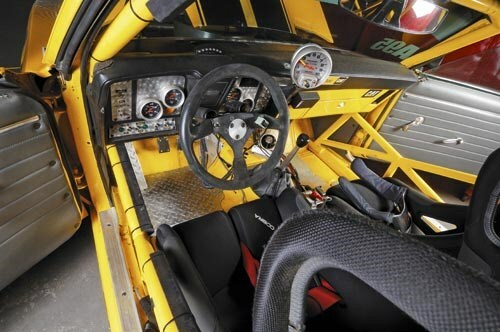 Indeed, he is best known for his wild exploits in Supertruck racing, taking out the National Supertruck Title in 2006, 2007, 2008 and, in what was a close and controversial finish, placing second in 2009. 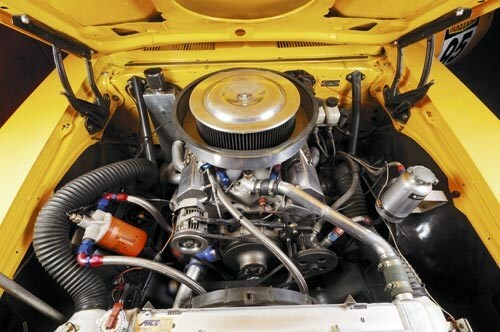 When TCM beckoned, Middleton decided to throw his considerable resources into the search and build of a race car, and long-time crew chief Mark Peacock got the gig to turn up the right car to convert into a TCM front-runner. Peacock takes up the story. "Given the eligibility regs of the time all roads led to a Camaro. The car was an original road car imported from Alabama in the US. Although, the truth is it was pretty rough. 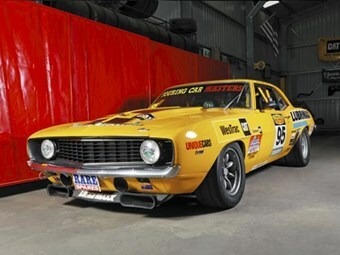 It was originally [TCM stalwart] Tony Hunter's car, but he decided against building it into another car. The beauty of this one is that it came with a TCM licence as well. That probably got it over the line and we purchased it." Another big plus in opting for a '69 Camaro is parts availability. "You can build one from brand new parts, even down to shells," says Peacock. That was the good news, but as so often happens, stripping the car revealed a world of pain. "It had rust damage in the rear quarters, and a lot of bog. The front sub-frame was well bent. It wasn't a great car." But further discoveries during the dismantling raised the collective eyebrows of the Whiteline team. It was a case of 'only in America' when Mark inspected the Camaro from the deep south. "It was quite a thing when we first got it. It was matt black and owned by a bloke called Jesus from Alabama. It had bullet holes in the driver's floor! Someone had lent in the window and tried to shoot Jesus' nuts off at some stage. "He was a Puerto Rican, we know that because his licence was still stuck up in the visor," says Peacock. Yes, the car had certainly had an interesting life stateside. Back to the job at hand. The build began in earnest in mid-2008; Middleton wanted the car ready for the 2009 season. While that was achieved, it meant countless late nights and weekends for the man charged with the build. "I've built lots of race cars, but this one took twice as long as I thought it would because I had to restore it as well as create a race car. Lots of rust repair, a big job," says Peacock. While Touring Car Masters regulations are aimed at producing cars that are totally recognisable and faithful to their original road-going equivalents, the fact is these cars are very different. There are technical allowances for up-to-date passive safety equipment and sensible technical variations to allow for race schedules, replacement of obsolete components, performance restrictions, individual performance adjustments, and up-to-date active safety components. Such is the case with the Camaro. It's not smoke and mirrors, but TCM cars are becoming pretty sophisticated as the category progresses and grows. "There is not one standard component in the car - save for the window winder - and we have changed the pick-up points for all the suspension componentry. In fact, there is just one bolt in its original position in the entire front-end," Peacock says. Pretty trick stuff. These days the car is raced by Tasmanian-born ex-touring car (along with Formula Ford and myriad other categories) ace Andrew Miedecke. While Middleton drove the Camaro in 2009, recording a couple of top 10 finishes, the decision was made to allow the car to meet its full potential with the accomplished Miedecke behind the wheel. "We were practicing at Eastern Creek prior to the 2009 Muscle Car Masters and Andrew was there," Peacock recalls. "He wasn't driving anything at that time and Bob suggested he suit up and have a pedal of the Camaro. He'd never sat in it before, went out and was immediately competitive." That started discussion around Miedecke assuming the driver's seat and the deal was done for him to take the wheel in 2010. His first race meeting kept the surprises for the mob from Whiteline, Miedecke winning the season-opening Clipsal 500 round. Due to a technical infringement, his points were subsequently rescinded, but it didn't matter. The message had been clearly sent and there was a good deal of chin rubbing and earnest discussion in the TCM pit. Here was a new player, the team was dead serious, and the bloke in the race suit was definitely fast. While the decision to put the seasoned Miedecke into the car was widely applauded, it highlighted deficiencies in the car. The Camaro struggled at tracks with high-speed corners in 2010, such as Winton and Hidden Valley. It was decided that the car needed a total re-think, and Peacock set about re-designing the suspension. "Because Andrew had done so much touring car test driving with the Stone Brothers [V8 Supercar team], his feedback to me was a huge asset. I would say it is one of his greatest strengths and it was a massive help in working out which way to go with the major changes I decided to make to the car," says Peacock. "I changed spring rates, as well as the shock package, added diff dampers to control wind-up, and altered the front geometry. The uprights were changed from Camaro to HQ Holden-style items. It was a major rebuild really, and the upshot saw us back on the pace. "We stiffened the car significantly when Andrew took over, he could drive it more stiffly sprung and riding lower. "That all made it better on the longer tracks and we would have probably won at Bathurst that year, had we not cut a tyre," says Peacock. The biggest challenge in the build was getting the car down to the TCM minimum weight allowance of 1600kg and then achieving optimum weight distribution. 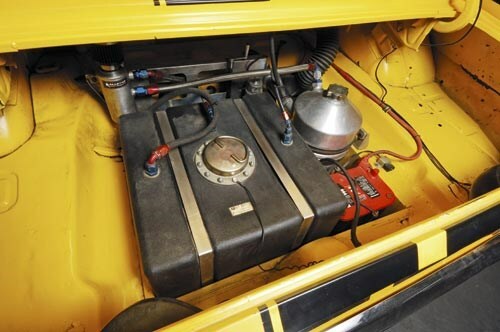 "We have recently changed to fibreglass rear springs and that has helped get weight out of the car. You have to put it back (lead ballast), but at least you can put it in the right places to square [the chassis] up as you'd like it," says Peacock. There are probably five cars that are currently fast enough to achieve regular podium results. 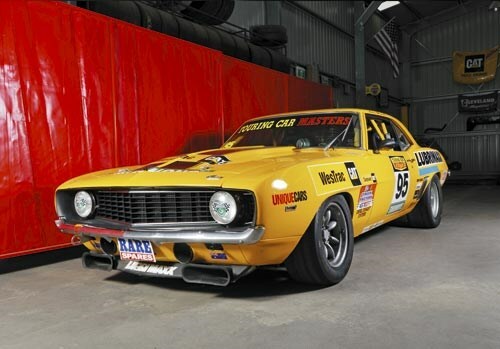 The big yellow Camaro has developed into one of them, and with Miedecke steering, the Whiteline Racing Team is rightfully looking to a podium-filled future in the Touring Car Masters.